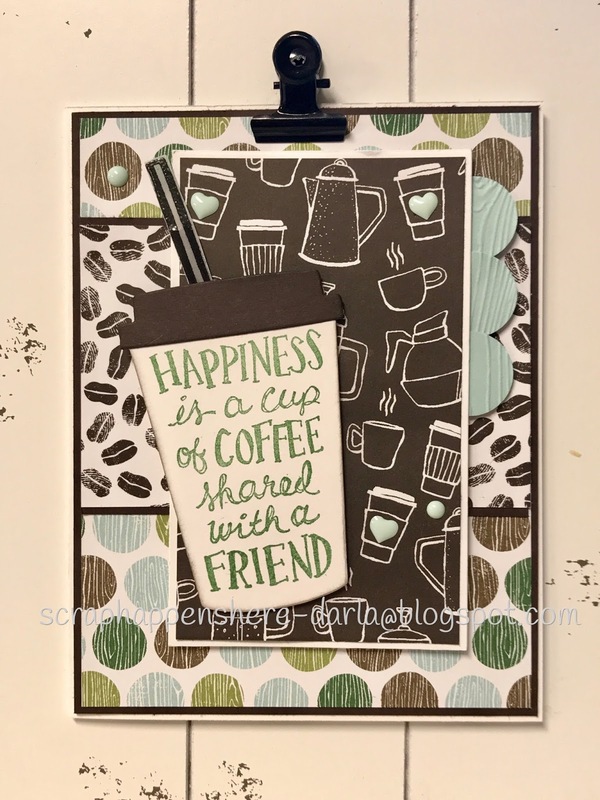 Scrap Happens Here with Darla: Time for COFFEE! Hello everyone! I'm hoping all is well with you this beautiful but HOT day!!! I'm gearing up for 109 today! I'm not a big fan of over 100 degrees. I don't have air in my workshop (yet) so it gets a bit warm. Everything went great in Modesto yesterday! I signed the papers for the sale of my folks home. We were able to get my moms hutch, table and chairs to the American Cancer Discovery Shop (such a cute shop). A friend of mines college aged son brought a friend and helped us load it! I was so grateful because it was so heavy. It was hard to give it away, but it went to a great little shop where the ladies were just giddy at how beautiful and well cared for it was! I remember my mom saving and saving for it! I found the Breuner's Furniture ad where she had it circled (I saved this) and the receipts for the purchase! She enjoyed it for over 30 years. I felt bad for not bringing it home...I'm very sentimental and love old stuff, but I just had no room in my house...the hutch was HUGE, plus I had a plank table built for me when I remodeled my kitchen! I think my mom would have been happy that we donated it to the American Cancer Society so I'm ok! Adam and I shared a funny memory about it this morning! He asked me if I took a picture of it and I said no, that I had forgotten (I was dripping in sweat and wasn't thinking of photos...but I did once I was cooled off)! I asked him why and he said "because I've never seen the top of it!" My mom had a thick cover for it and then always had a tablecloth over the cover when we ate. She also covered the cushions with a towel when my kids were little and sat on them to eat...protecting them from the inevitable spill! We giggled! It's funny the things we remember!! I made today's card for a Sketch Challenge on my team facebook page. Sketches are so fun and help me get going when I'm having a creative block! 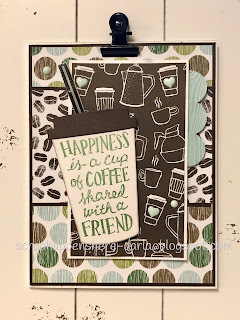 This card is created with the Coffee Cups Framelits, the Coffee Cafe stamp set and the Coffee Break designer paper! The stamp set and the framelits are sold as a bundle, saving you 10%! I wanted to point out a couple of details of this card...the straw is stamped on Vellum paper with VersaMark and heat embossed with black embossing powder. Finally it is cut out with Coffee Cup framelits. Next...the scallops are created with 3/4" circles as I didn't have a scallop die that is current and we are required to use only current product for challenges. I embossed the circle with the Pinewood Planks embossing folder. 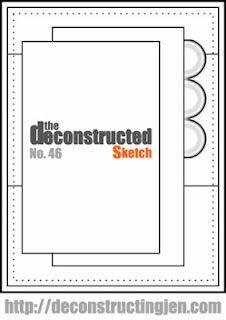 Here is a picture of the Sketch we used. This makes the rest of the card pretty self explanatory. One thing I did a bit different is that I matted my designer paper onto a piece of Early Espresso and Whisper White card stock to make them pop! I'm sure you've also noticed by now that I used the coffee cup as the top rectangle piece! It's a FUN sketch. I'm gonna use it again, but this time I will jot down my paper measurements and share them with you! 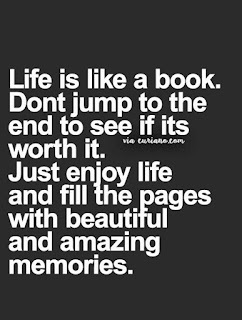 It's my plan to be better about that...and won't it make your creating easier!!! Well...on with the day! THANKS BUNCHES for stopping by! 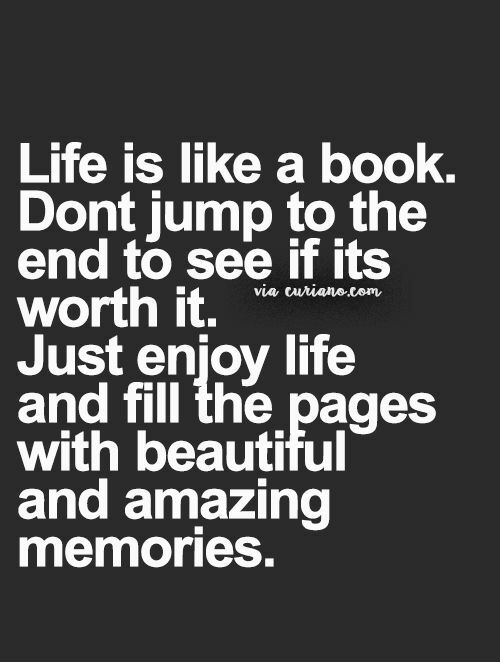 Have a FANTASTIC DAY!!! Really cute card Darla. Coffee is always better when shared with a friend!! Thanks BUNCHES Linda! It's true...coffee is best with shared with a friend! Let's treat ourselves to a cup and a visit SOON!! !